I will never forget or forgive you. That was a gorgeous day. Next > Greetings from Florida! 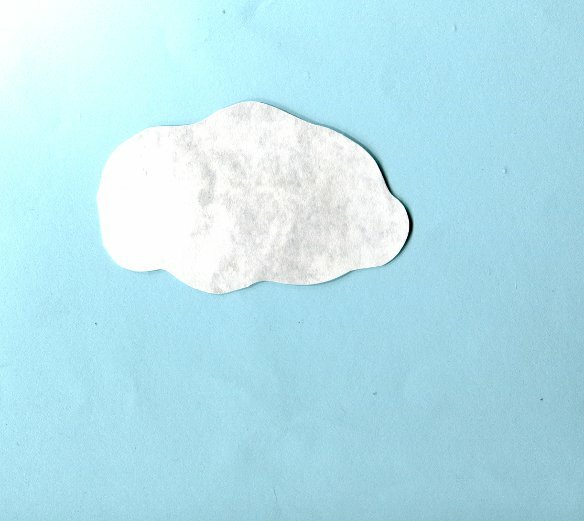 I LOVE how you always manage to create a sense of time in your work…the cloud!! Amazing. Haha, thanks! I’m glad you liked it! WHAT is that? An angry badger or something? I’m going to have nightmares (although as long as it’s a nightmare in the style of paper cutouts, that might be kind of awesome). Badger! Badgers are quite aggressive in North America. They never wear hats or smoke pipes like they do in England. They just bite and swipe at things. It’s not very charming. Oh right, haha, the title of the post! We have some really mean city raccoons, so I understand. What a mean old badger! How long did he stay? It seemed like forever, but it was probably only a few hours. yikes! i bet that made for such a lonnnnggg day waiting and hoping mr. badger would find some place else to hang out. It really did drag. He must have been looking for field mice or something… he tramped around our yard for ages. The first thought I had was how sad those three little girls looked. I thought it was a rainy day. 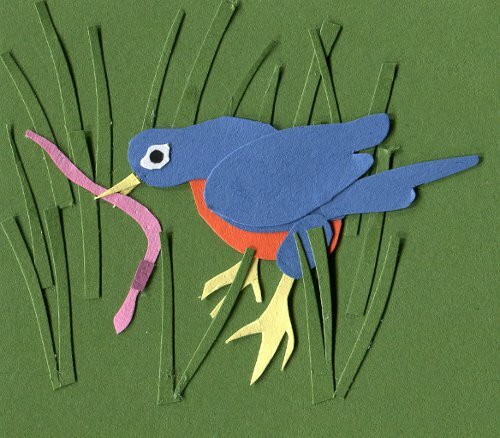 But the your story unravelled; everything was beautiful outside; the flowers just beginning to bloom, clear sky with a puffy white cloud, and robin catching a worm. THEN came the villain! 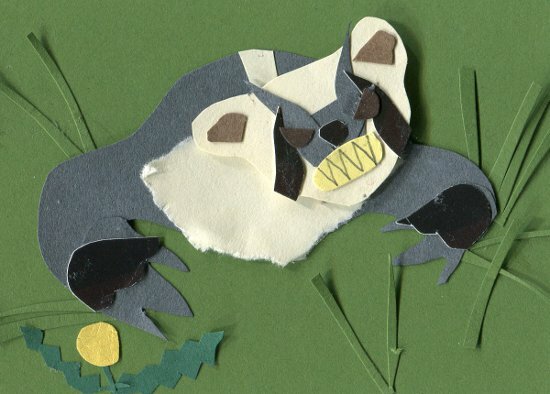 What a nasty badger it was, with layers and layers of paper to create his nasty face! Charming addition to your collection of cut out memories. Thanks Ronnie :) I think about that badger often. I’m happy I was able to capture the memory in paper! 1. I can’t believe your mom actually painted the shutters fuchsia! Oh, she did. And the front door was pink! …I sang badger badger badger to myself all morning. A pink front door! How fun! As always, excellent post! I really loved your comment about English badgers. Too funny! My husband didn’t believe me that North American badgers were so vicious because he had only been exposed to English badger stereotypes. We spent a few hours discussing it on the couch over a holiday. Beer might have been involved. 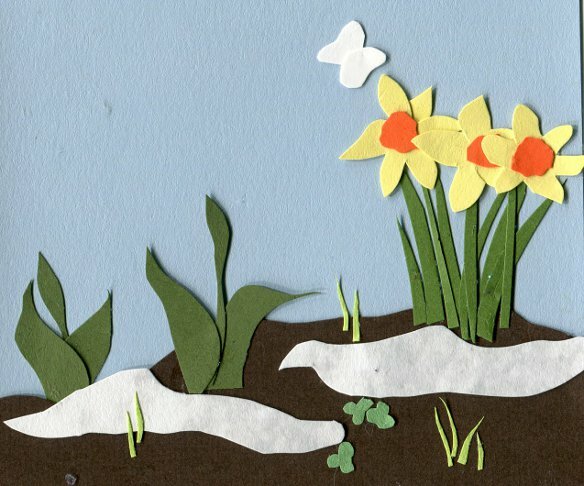 Surely not on glorious, perfect, Spring days when the sun is shining and the breeze is warm and all of Creation is reawakening after a long hibernation… Surely not then! What were those flowers called that bloomed right at the end of winter but died almost instantly? My memory is failing me, I thought it was crocuses because I have a vague memory of mom telling me they were called that because the croak right away. A good excuse if I ever heard one. Wish I could celebrate, too! I have a recipe for grasshopper pie in a book I got for Christmas, called “Vegan Pie In The Sky,” but it looks really hard to make. I’m seriously thinking about reblogging all weekly posts from The Middlest Sister. This one is great, as always. The Honey Badger lives! This is so great! I would have been throwing things out the window. Specifically my sister’s toys. That risks upsetting the both the badger AND the sister. You’d have no safe haven! Maybe you could throw Brussel Sprouts at it instead. Oh, to be badgered by a badger. What rotten luck! Oh my! My kids have been run inside by a snake before. Darn wildlife. Another fantastic “episode.” Loved it. 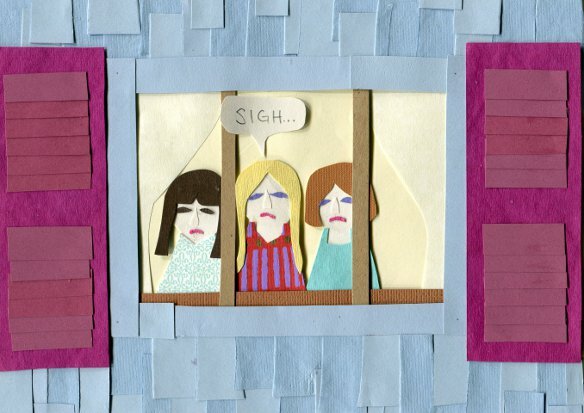 I love all the emotion you can reveal in little scraps of felt. I’m curious about the badger’s feelings concerning your feelings concerning him or her (I respect its privacy). I suspect his/her feelings were focused solely on the hunt for field mice. Love your style! Glad I found ur blog! Hi Nicole, I come from a big family too, and this blog really strikes a chord for me. 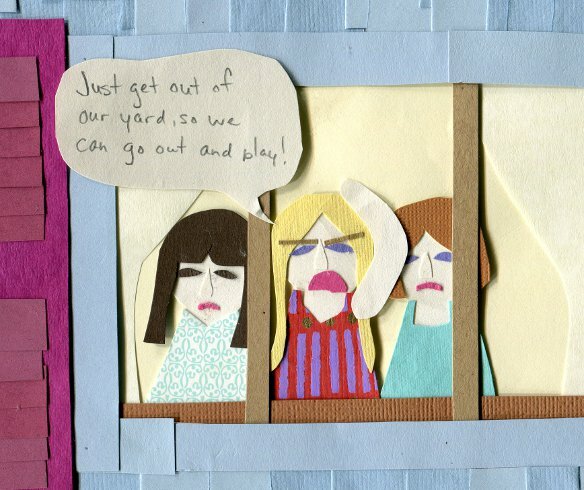 I enjoy not only your illustrations, but your humorous depictions of family life. That is why I am nominating you for a T.M.I. Award in my next post. I think I just wet my pants. I put badgers right up there with hyenas as the scariest mammals alive. Thank you! No one ever sympathizes when I tell this story. It’s always, “Eh? It was just a badger…? Why didn’t you just go shoo it away?” Badgers are vicious! Thess are amazing! I just can’t imagine how much time you must spend building each story board. You obviously love doing it, and it shows!